The Series DPT Digital Pressure Transmitter with Switches combines a large, 14-segment LED display with two programmable solid state switches into one compact unit. A unique, 3-way rotating design allows the DPT to meet specific installation requirements without any retrofitting. The display and electrical connection can be rotated independently to maximize visibility while still orienting the electrical connection in the best position for the cable connector. Large, ergonomically designed push buttons allow for quick/easy programming and thin-film piezoresistive sensor technology guarantees long-term reliability and stability. Service: Compatible gases, liquids or vapors. Wetted Materials: Pressure connection: 316 L SS; Pressure sensor: 316 L SS (13-8 PH for ranges above 150 psi). Housing: 316 L lower body, heat and chemical resistant fiberglass reinforced plastic (PBT) plastic head, TPE-E keyboard, PC display window. Accuracy: 1.0% F.S. (includes non-linearity, hysteresis, zero point). Pressure Limit: See Catalog page.Temperature Limits:32 to 176°F (0 to 80°C). Process Connections: 1/4" male NPT. Display: Red LED 4-digit (0.35" H digits). Weight: 7 oz (0.2 kg). Switch Type: PNP.Electrical Rating:250 mA. Electrical Connections: M 12x1, 5-pin. Temperature Limits: 32 to 176°F (0 to 80°C). Thermal Effect: 0.2% FS / 10k. Power Requirements: 15 to 35 VDC. Output Signal:DPT-A: 4 to 20 mA; DPT-V: 0 to 10 VDC. Loop Resistance: DPT-A: ≤ 0.5k; DPT-V: > 10k. Power Consumption: ≤ 100 mA. 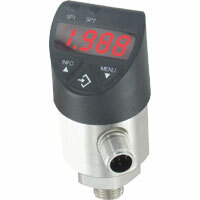 Digital pressure transmitter, range 0 to 500 psig, 4-20 mA output.